The Chimp is the emotional machine that we all possess. It thinks independently from us and can make decisions… the main purpose of this book is to help you to manage your Chimp and to harness its strength and power when it is working for you and to neutralise it when it is not. Are you struggling to make sense of yourself? Do your emotions sometimes dictate your life? 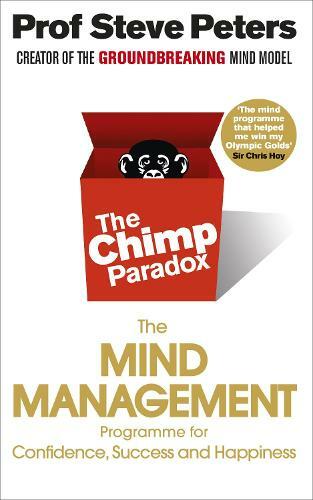 The Chimp Paradox is an incredibly powerful mind management model that can help you become a happy, confident, healthier and more successful person. Prof Steve Peters explains the struggle that takes place within your mind and then shows how to apply this understanding to every area of your life so you can: - Recognise how your mind is working - Understand and manage your emotions and thoughts - Manage yourself and become the person you would like to be. The Chimp Mind Management Model is based on scientific facts and principles, which have been simplified into a workable model for easy use. By giving you an understanding of the way in which your mind works and how you can manage it this book will help you to develop yourself and give you the skills to remove anxiety, have confidence and choose your emotions. It will help you to identify what is holding you back or preventing you from having a happier and more successful life. Each chapter explains different aspects of how you function and highlights key facts for you to understand and offers exercises to help you develop. By undertaking these exercises you will see immediate improvements in your daily living and, over time, you will develop emotional skills and practical habits that will help you to become the person that you want to be, and live the life that you want to live. Consultant Psychiatrist Professor Steve Peters rose to prominence through his work with the British Cycling Team, helping its members overcome negative behaviour and achieve dazzling success. The Chimp Paradox is the practical distillation of these techniques, becoming a runaway best-seller with its promises of measurable self-improvement. My Hidden Chimp, a version of the same programme for children, was published in 2018. This isn't quite the worst "self-help" book I have ever read but it is awful. The thought that anyone in real need of help might turn to it is worrying.